The dictator was an experiment where one person given authority (the dictator) were supposed to condition the reflexes of the painter in order to make good esthetic choices. Two persons were part of the experiment one took the role as the dictator ant the other as the painter. No verbal communication were accepted, the painter could not see the dictator. The dictator could see the painter trough a surveillance camera. The painter didn’t have any forehand information and the dictator could only communicate by a system of rewards (food) and punishment (nasty noise). 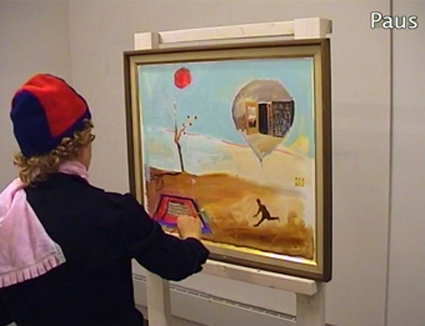 The interior to the experiment, the note of the dictator, the painting made by the painter and the movie filmed by the surveillance camera was shown in the gallery.